I really didn't get a chance to know my Grandma Mickey, because she died when I was three years old. But from the stories I've heard, she was a big fan of making sure that cookies were offered when you were there to visit. And one of her recipes is still made on a regular basis by practically everyone in my dad's family. While I'm sure there are numerous recipes out there for Sour Cream Cookies, I like to think of it as our family recipe. It has been passed down through generations of family members. There isn't a Christmas holiday that I can remember that these cookies haven't been made at my house. 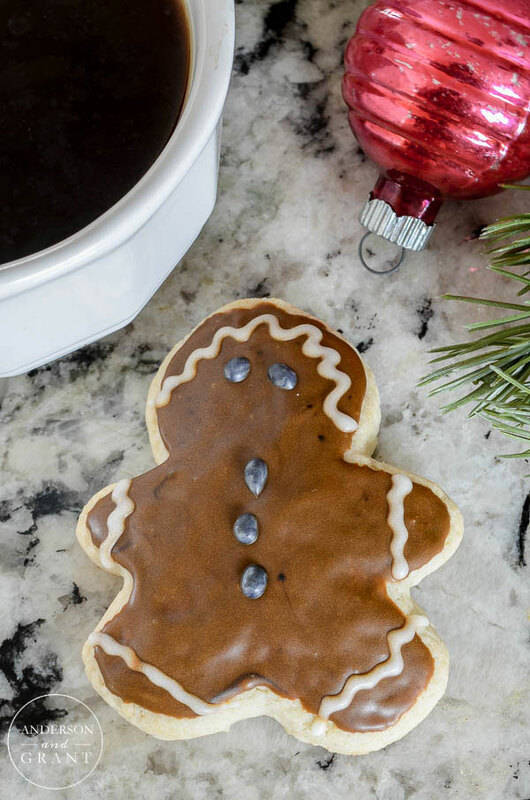 Sure, there are years when there is a little less time and they are made as a drop cookie rather than being cut out and decorated. But in some form or another, Sour Cream Cookies must make an appearance. I have to admit that baking these sour cream cookies lets me connect for just a moment with a grandmother than I wish I could have gotten to know. It is just another way that I'm trying to remember the past during this holiday season. 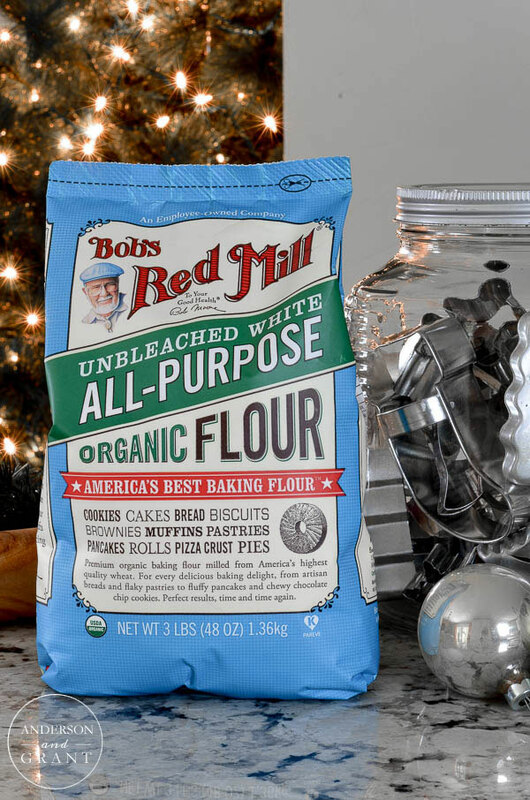 This holiday, I've been given the opportunity to work with Bob's Red Mill and try their Organic Unbleached White Flour. 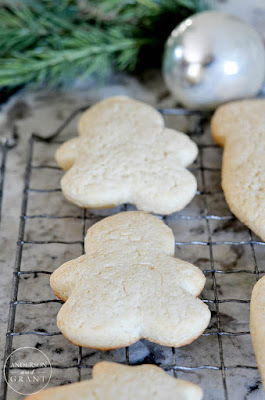 What better time to try it out than with my beloved cookie recipe, right? 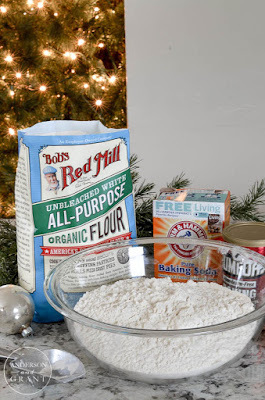 This is the same high protein flour used by professional bakers and it produces high, well-textured loaves of bread equally as well as light, airy baked goods....like my Sour Cream Cookies. Sour cream cookies are actually great to make with kids, especially when it comes to decorating. I've made this recipe countless times and have found it to be pretty fail-proof and uncomplicated. While I've seen other recipes instructing you to chill the dough or comments saying that the cookies turned out like pancakes, the ratios of ingredients in this particular recipe must be right on because I've never had a problem. While these cookies look very similar to sugar cookies, they have a unique taste all to their own.....although you can't actually taste the sour cream in the finished cookie. And the combination of the cookie and frosting is what really makes this recipe spectacular. The dough can either be rolled out and cut with cookie cutters or dropped by tablespoon amounts directly onto an ungreased cookie sheet. Baking times are approximately the same either way. I prefer to use paste food coloring from Wilton when tinting the frosting because it gives you a more vibrant color. 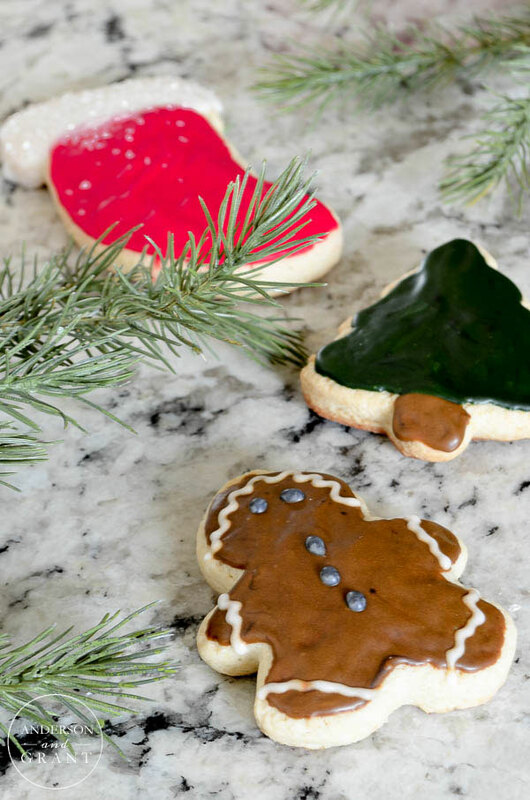 If you are decorating a cookie with multiple colors or adding details, be sure to let the first color of frosting dry before adding any more. 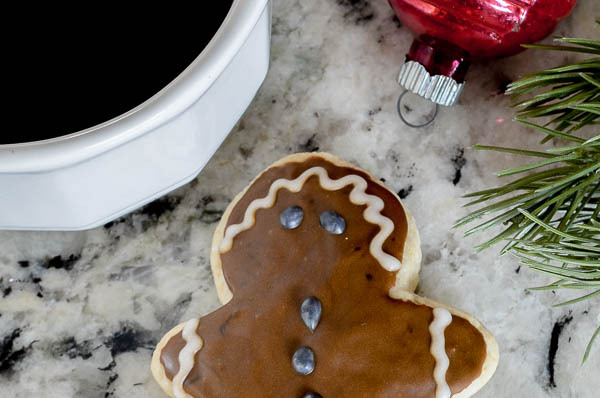 So are you ready to start baking some holiday cookies with me? 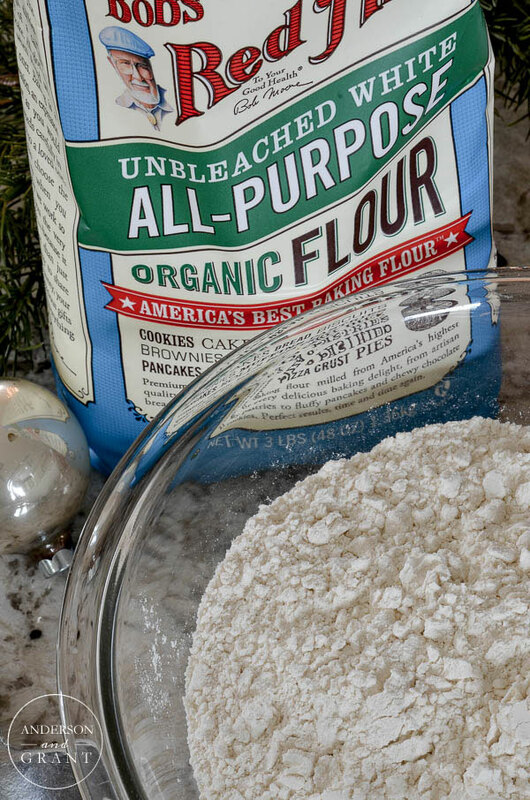 In a large bowl, combine the flour, soda, baking powder, and salt. Set it aside. 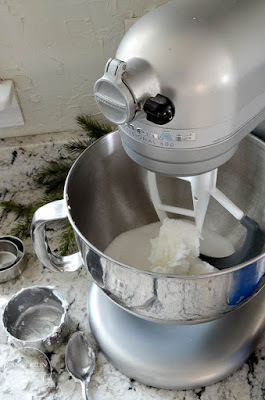 In the bowl of an electric mixer, cream the sugar into the shortening until it is soft and fluffy. Add the flour mixtures to the creamed sugar and shortening. Mix until combined. Then add the sour cream, eggs, and vanilla. The dough should not be very sticky. 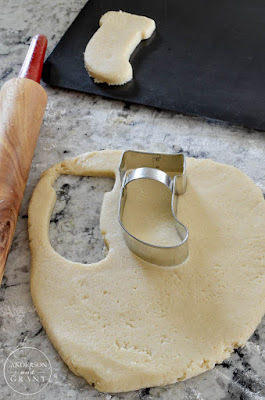 You can either drop tablespoons of dough onto an ungreased cookie sheet or roll the dough out to cut shapes using cookie cutters. The cookies will puff up a bit, so don't roll the dough too thick. Bake the trays of cookies at 350 degrees for 10 to 12 minutes or until the edges start to brown. Remove the cookie sheet from the oven and remove the cookies to a wire rack. Allow the cookies to cool completely before frosting them. To make the frosting: Mix the three frosting ingredients together and stir until combined. If the frosting seems too thick, add a few drops of milk. You can then divide the frosting into separate bowls and add food coloring if you wish. 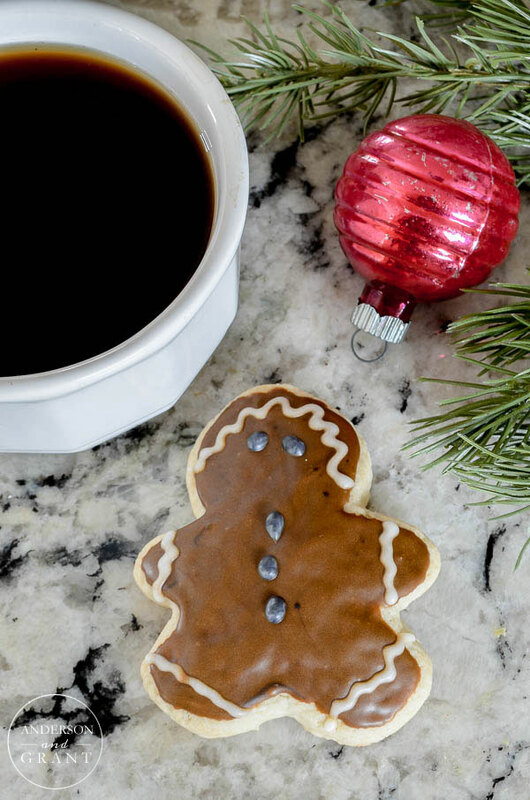 Add sprinkles or whatever embellishments that you desire to make your cookies perfect for your family immediately after icing the cookie. Do you have any family recipes you make every year at Christmas time?